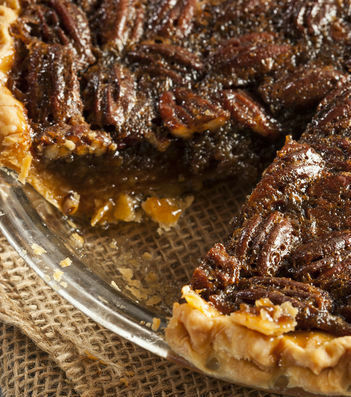 Pecan pie is one of our absolute favorites. It’s sweet and nutty, and always brings back fond memories, so there’s a special place in our hearts for this classic treat. While we’ve made maple pecan pie and the ever-popular pecan pie bars (perfect for any get together), we realized we hadn’t yet shared our favorite of them all, the classic pecan pie! Before ever making it ourselves, we figured this pie would be tricky to make, so imagine our surprise when we found out how simple it is to whip up! If you decide to make your own crust, you’ll have to tack on some more time, but the basics of this dish are pretty simple; beat together your filling ingredients and fold in the pecans! After that, you just have to pop your pie in the oven and set the timer– easy as pie!